Forget the berets and baguettes, being Parisian is all about perfecting your ‘depressed Metro face’. 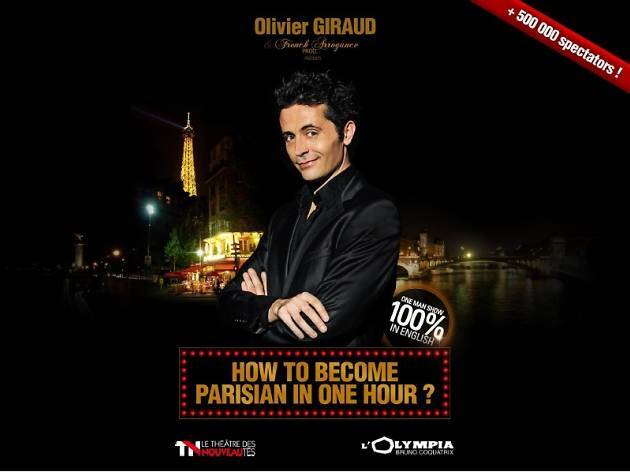 At the Théâtre des Nouveautés, Olivier Giraud is on a mission to take Anglophones deep into the dark heart of becoming the perfect Parisian. The first order of business? Leave the striped shirts, berets and baguettes behind and start working on your Parisian scowl. Giraud’s one-man show is divided into several important lessons, from how to take the metro like a Parisian (wipe that smile off your face and don’t give up your seat for anyone) to how to order at a restaurant (be as rude as the waiter). He’s at his best when he switches to his American and English tourist alter egos, hamming it up for their overexcitement at every Parisian experience (very un-Parisian indeed). There’s a moment of awkwardness with a slightly off-colour joke about Africans around the Eiffel Tower but no nationality is spared Giraud’s mostly hilarious skewering, not even the French, whose stereotypical grumpiness is the essential lesson to learn. 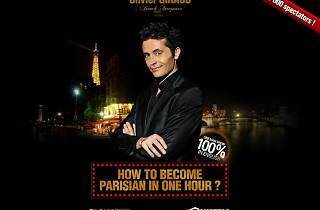 Giraud’s performance has the audience in tears of laughter throughout, compounded by the segment where members of the crowd are picked at random to join him on stage and show off their new Parisian skills. On the day we visited, two members of the audience (from Peru and Scotland) nearly outshone Giraud himself with their sensational Parisian portrayals.